Sharply printed; perfect registration; excellent variety; comprehensive placement guide. 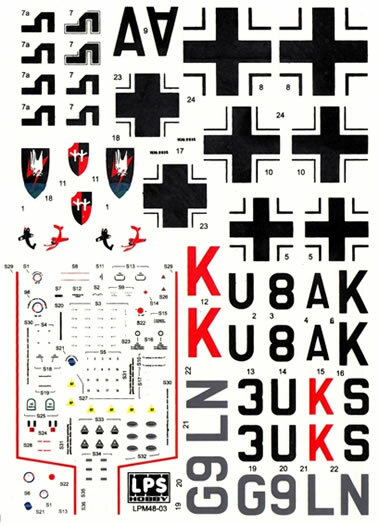 These decals sheets offer the modeller an alternative choice of Bf 110 markings and in some cases will also enhance the finished subject. 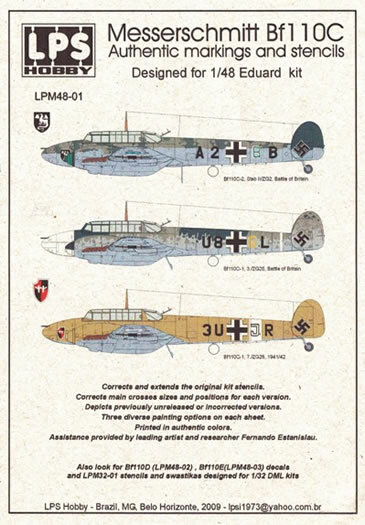 LPS Hobby has released a number of new decal sheets which cater specifically for the Messerschmitt Bf110. 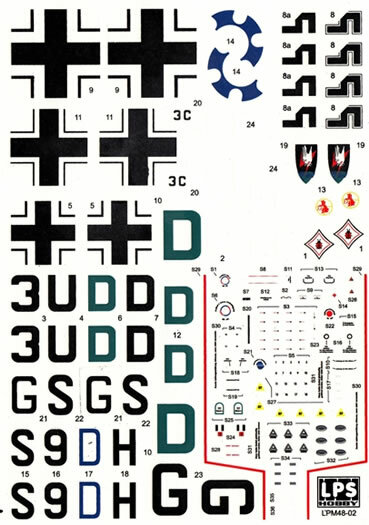 Three of these are designed for the Eduard kit, with the fourth providing additional stencilling for DML’s offering. The former sheets also carry this data which makes them a very comprehensive package. 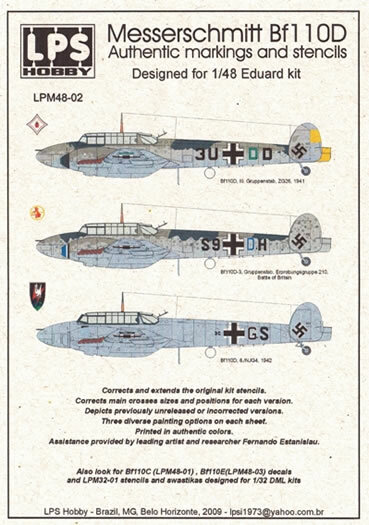 Each of the 1:48 scale releases has been made to improve on a particular variant of the ‘Zerostörer”. 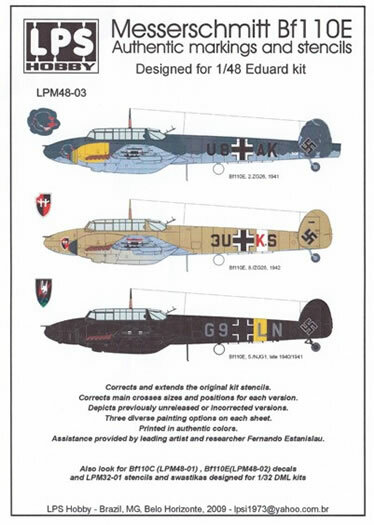 The manufacturer boldly states that the intentions are to “correct and extend the original stencils; correct main cross sizes and positions for each version; and to depict previously unreleased or incorrect versions”. Upper surfaces RLM 02/RLM 71 (parts with random mottle effect); under surfaces RLM 65 including wing leading edges. Uppersurfaces in RLM 79, with under surfaces in RLM 78. Upper surfaces RLM 02/RLM 71; under surfaces RLM 65 including wing leading edges. Yellow markings on the rudder are present but the extent of this colour on the tail is left to the modeller’s imagination. Upper surfaces RLM 02/RLM 71; under surfaces RLM 65 including wing leading edges. Upper surfaces camouflaged in RLM 74/RLM 75 covering previous scheme; under surfaces in RLM 65 including wing leading edges; yellow cowls. Uppersurfaces in RLM 79, with under surfaces in RLM 78; white fuselage band. All surfaces in black; yellow fuselage band. 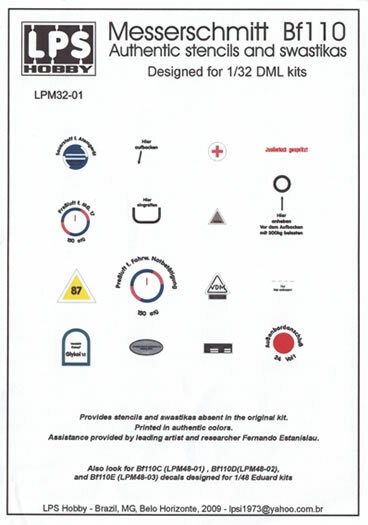 As with the previous offerings, Fernando Estanisiau is the leading artist and researcher for this sheet. 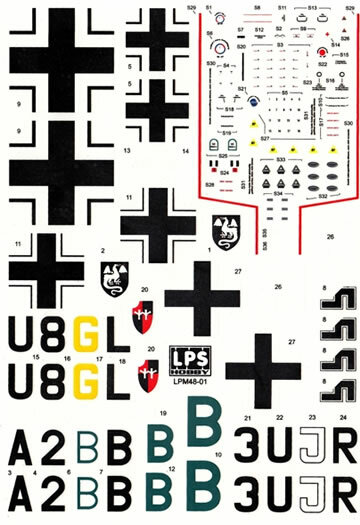 It’s designed to provide the modeller with stencils and swastikas that were not included in the DML kit. There’s plenty of data presented here including some of the more rarely seen markings. With a full compliment not always present on any single aircraft, there’s a chance that the spares box will also benefit. The registration of the colours was spot-on and the density looked good. A package like this needs a good placement guide and thankfully one is provided in the form of a comprehensive diagram. 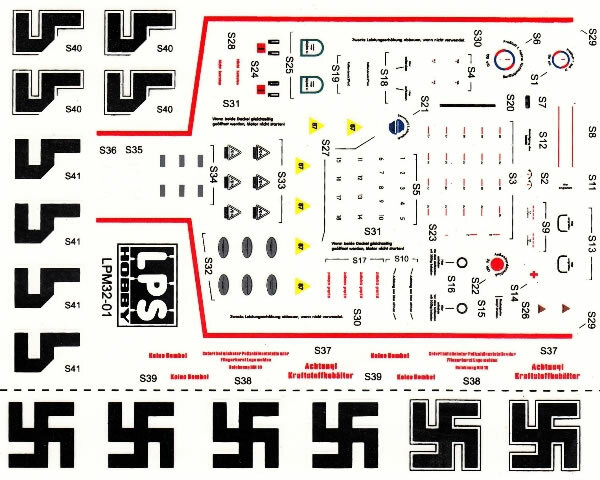 So if you feel that your Bf110 needs a change of face, or misses out on a few crucial decals, then these sheets are well worth considering to put things right. Thanks to LPS Decals for the samples.